Egypt’s PM Qandil denies Copts had fled their homes in Sinai, as officials and residents say the Christians received death threats. Egypt’s Prime Minister Hisham Qandil denied on Saturday that Copts had fled their homes in Egypt's Sinai Peninsula, after officials and residents said the Christians left after receiving death threats from suspected Islamists. 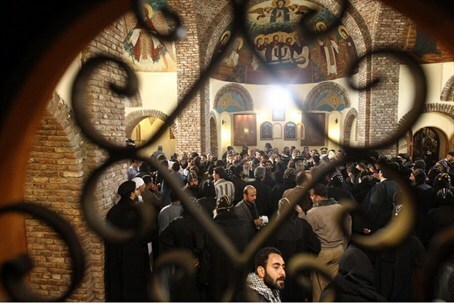 "The instructions given by the Egyptian authorities is to protect the Coptic brothers wherever they may be," Qandil told reporters in remarks carried by the state-run MENA news agency and quoted by AFP. He said there were no "forced evacuations" of Copts from the Sinai, but that one family had decided to relocate. The National Council for Human Rights set up by Islamist President Mohammed Morsi, however, issued a statement on Saturday saying "threats" had been made against Copts in the Sinai border town of Rafiah, forcing families to flee. The council said it was monitoring developments in Sinai with deep concern and urged the authorities to protect them, warning of dire consequences if their lives were at risk. "If the state drops this responsibility, it will be a dangerous precedent in Egypt, taking the country to dark ages, instead of (strengthening) the rule of law," the statement said. On Friday officials and Sinai residents told AFP that several Christian families have fled their homes in the Sinai after receiving death threats from suspected Islamist militants. Last week, flyers began circulating in the town of Rafiah on the Gaza border, demanding that its tiny Coptic population move out, residents told AFP. Father Mikhail Antoine of El-Arish church told AFP "the families moved voluntarily because they feared for their lives after the threats." Copts have been nervous since Islamists came to power following an uprising that toppled president Hosni Mubarak last year. There have been several attacks, some of them lethal, against Copts in Egypt. Last month, Muslims attacked a Coptic church in a village near Cairo. At least 16 people were wounded in the melee, among them 10 police officers. Egypt's Christians, who make up six to 10 percent of the country's population of 82 million, have regularly complained of discrimination and marginalization.